Sign up for a chance to win VIP Passes to a NASCAR Camping World Truck Series race near you! By signing up, you agree to allow Chris Lafferty, Lafferty Motorsports, and Chris Lafferty's Motorsports TV to send you periodic e-mails to the address you have provided above. 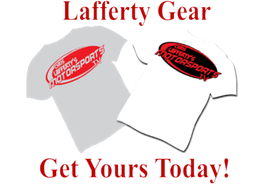 *PLEASE NOTE, Lafferty Motorsports does not under any circumstance sell or share your information with anyone. All information remains strictly confidential.